In a classic Simpsons episode featuring cameos by Alec Baldwin, Kim Basinger and Ron Howard, the Happy Days star and acclaimed director steals a movie idea from Homer Simpson. It gets greenlit after Howard notes the robot’s best friend is a talking pie. Why does the robot travel back in time? While we’re on the subject of nonsensical plot points, why is an environmentalist group at Stanford complaining about a libertarian social scientist? 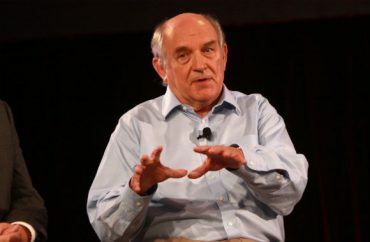 Students for a Sustainable Stanford, which is also “inclusive and intersectional,” wrote to Stanford President Marc-Tessier Lavigne to scold him for inviting author Charles Murray to a “Cardinal Conversations” event. The new speaker series is led by students and intended to feature “disagreement” without “crass or demagogic” arguments, and “thought-provoking” speakers rather than “simplistic liberal-conservative duels,” according to two campus editorial boards who serve on Cardinal Conversations’ student committee. The first such conversation was Wednesday night between venture capitalist Peter Thiel – a rare Donald Trump supporter in Silicon Valley – and LinkedIn co-founder Reid Hoffman. They first met in a Stanford philosophy class, according to The Stanford Daily. It’s not obvious from Students for a Sustainable Stanford’s portfolio of issues why it’s weighing in on Murray, whose best-known work The Bell Curve is often accused of espousing eugenicist views, though few critics seem to have read it to confirm the hearsay. While we respect and encourage debate from diverse perspectives about difficult topics, Murray’s history of racism and using pseudo-science to further racist ideas is deeply disturbing. We disagree with Stanford allowing him to perpetrate his views at an institution as prestigious as this one, because it lends undue validity to dangerous ideas masquerading as academic thought. “As an educational institution, I feel like Stanford has the responsibility to only legitimize certain types of viewpoints,” said John Zhao ’18, operations officer of SSS. Kira Smiley ’18, another member of SSS’s leadership team, agreed with Zhao. Stanford leaders are standing behind Murray’s invitation for now, noting the format of the series pairs two speakers with dueling views in front of an audience that can prompt them to defend their views in real time. Future bookings may functionally exclude anyone who is viewed with such animus as Murray. Read the environmental group’s letter and Daily coverage of the Thiel-Hoffman event and Murray controversy.